All photos courtesy of John Gaddo & Nancy North. 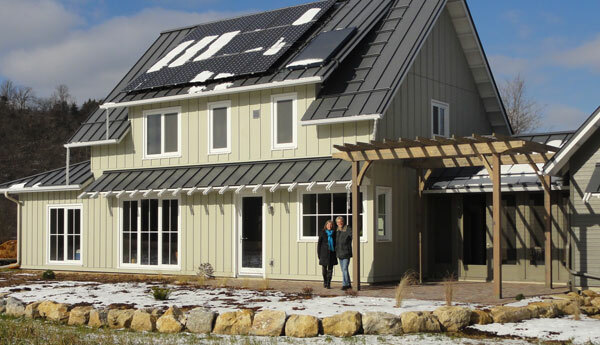 The Root River House is a net-zero energy consumer. This means that the building consumes no more energy than it is able to generate on site. Located in southern Minnesota and completed in summer of 2014, this project was designed and constructed using Passive House strategies - a set of building and construction techniqes that, when integrated, result in deep energy-use reductions (80-90% better than code!). Passive House strategies are based on a conservation approach, tapping the "energy of efficiency" in a cost-effective way before spending money on high-tech systems. Good design and a focus on the building envelope will allow for a smaller and more affordable solar system that can take the building the rest of the way to net-zero operation. 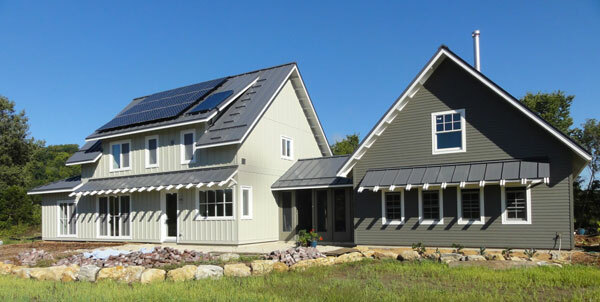 At the Root River House, a combination of passive solar strategies, super-insulation, high-performance windows and doors, extreme air-tightness, continuous ventilation with energy recovery, a solar hot water system, and solar electric panels, work together to achieve the end goal of net-zero energy use. 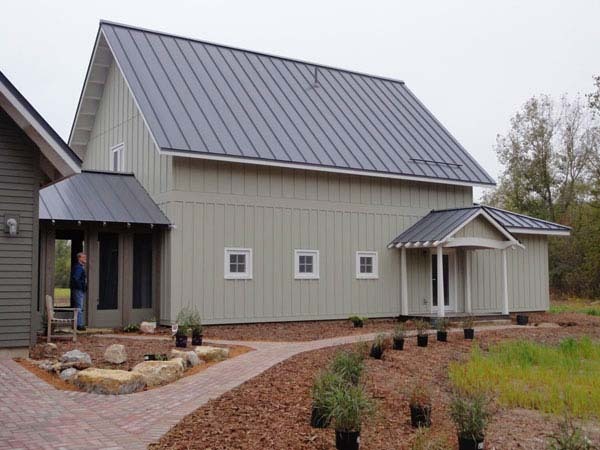 In the photo above, the "house proper" (on the left) utilizes Passive House strategies, while the structure on the right - containing a garage, workshop, storage and a root cellar - lies outside the super-insulated envelope. This is a cost-effective approach when designing a net-zero building. The two parts are united by a breezeway that converts to a screened porch in the summer. Above: Utilizing the sun's free heat begins with proper orientation on the site. This winter photo shows the south facade of the Root River House where large, south-facing windows act as collectors for the sun's heat. During the summer, deep roof overhangs and a shading canopy prevent the sun's heat from entering and overheating the building. This photo also shows the pergola in place, which will provide some dappled shading of the patio during the summer months. Above: In the spring, the shading elements begin to do their work. By mid-summer, the windows on the south side of the house are almost completely shaded. Shading elements also provide the opportunity for visually breaking up the compact shape typical of a super-insulated house. Below: In a Passive House, doors and windows are typically more sparse on the north side of the building (in the Northern Hemisphere), since they do not provide solar heat gain but do contribute to heat loss. Nevertheless, they are important since they provide views, daylight, and cross ventilation. Below: A typical cross section of the wall and floor system. Click on the link to the homeowner's blog above to read more.